Available singly or in 12 or 52 packs. 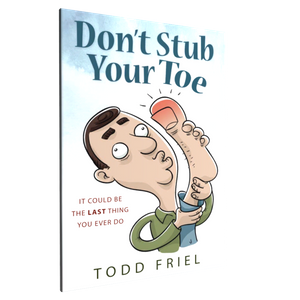 It is a piece of cake to share the Gospel with “Don’t Stub Your Toe.” Simply leave it on your restaurant table (with a good tip), or waiting reception, or any public place.. You can hand it to a drive thru attendant, or give it away as a follow up to your one-on-one evangelism. “Don’t Stub Your Toe” is a thorough Law and Gospel presentation written in a very accessible and friendly manner. You can read the entire booklet here. Read for yourself before you give it out: DOWNLOAD. We encourage you to read the booklet here, and then order 12 or 52 copies to freely distribute to people you care about…before they stub their toes.